We had a great time with the East Bernstadt team. Phebee shared some of her thoughts which are below. Now we have had another great week of sharing God’s Word with Pastors, Church Leaders, Women and Lots of Children. The C.L.T.A. classes went well. We studied 2 Timothy and committed several verses to memory. We had some long days for Bonnie and me, but I took the morning classes and she took the afternoon classes and closed at 6:00 PM; and we still were able to help a young lady named Grace prepare and feed everyone their lunch. Their favorite class is Bonnie’s Christian Family Living Class. We are so thankful for those that come here and teach and spend time with the people. It is also a blessing to have those that share their teaching material from around the world. They simply are doing the Great Commission through their love of studying and writing and teaching the Word. Emmanuel went to pick up corn and rice today at the farming project. Some pastors and others will enjoy that for Christmas. We also had lots of hot pepper and yams. Now where is that Goat, Sheep, Guinea or - well you fill in the blank. 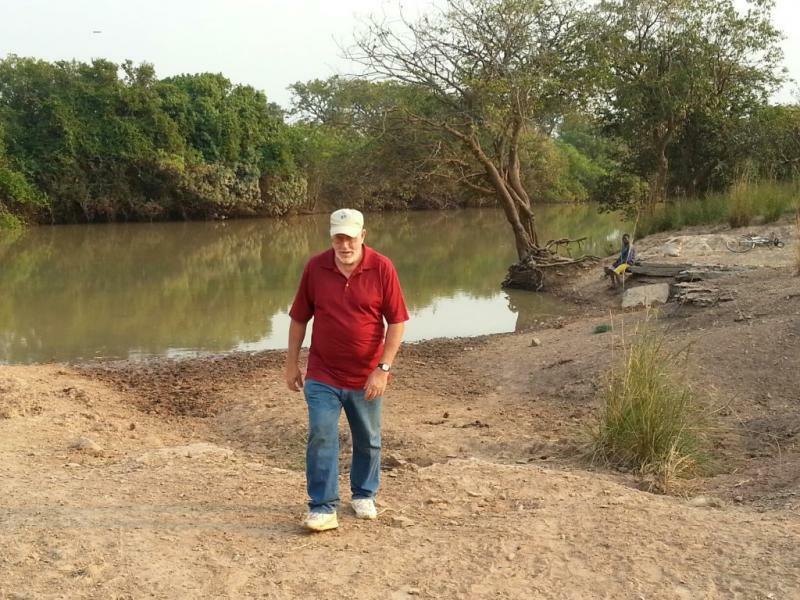 We have moved the engine boat ‘The Soul Searcher’ to the river Dakar and we are excited to see how God will use it in a new area. It has been on the Black Volta for the last 2 years and the project there is finished. We plan on an Evangelism Team with some different translators to work this area for at least 2 years. What a blessed trip!!! Here are a few of my highlights from the trip. First I loved the pastors/leaders training in Geshegu. I loved getting to share the story cloth with them so that they may go out and hopefully use it as a tool to teach and share the story of God and man and how we can be made right with God through His Son Jesus and how that throughout all of human history, God has been working to bring about our salvation. I loved sharing with them because sharing and talking about God and His plan of salvation with others believers is so exciting because we share together in our hope and our joy of what God has done and that is so encouraging. I loved getting to work with the children more than ever before. In the schools I got to teach with Sammie and we taught the older children, at one school the children did not know the story of Christ at all. So I taught with the story cloth and during my teaching God just gripped my heart with the lostness of those kids and broke my heart with such a desire for them to understand God's love for them. I loved getting to share the salvation story and play with the children during bible clubs! The laughter and excitement of the kids is contagious and melts your heart! I loved getting to fellowship with the staff of Seed Ministry and sharing together in the work. Each trip has its own blessings and struggles...but this trip was so special, I felt the need more than ever for the Gospel to go out and I see the efforts of seeds being planted for Christ kingdom poured out in abundance! May God receive all the glory for what He has done and is doing. Well, Phebee started me thinking about our time in Ghana (she is sort of an instigator) and I want to say a few word about God\'s grace and love and sing his praises and that of the work of Seed Ministry. Bob and Bonnie you have touched so many lives with you work in Northern Ghana and it is such a privilege to share just a small part of that action. We at FBCEB have received so much more than we were able to give while there that I feel almost embrassed so say I taught pastors and leaders. Fortunately I always had a Seed Ministry translator with me to do the real teaching and so I just had to show the love of Jesus and let others do the teaching. We had a great time in the village of Gau when Bro Norm presented the Gospel to the Chief and he accepted Jesus on the spot. He and the village are in our continued prayers so that he may stay strong in his faith and may grow abundantly through the power of the Holy Spirit. I have been burdened and broken for that village and their water problems. We will pray incessantly for a solution and I know in my heart that God will show us the way to give them water soon. Thanks, Bob and Bonnie, for your participation in the renewal of our wedding vows and even if Connie stumbled on Proverbs 31, I know her true self (after 50 years) and she is closer to that woman than she would lead one to believe. We were truly blessed by the ceremony and by God to be together for over 50 years. ( ok, maybe not all 50 but at least 40 to 45 have been blessed) Just kidding, Connie. Seriously, thanks again for sharing in our celebration and for the work you and the staff are doing in Africa. God\'s love is for all the world and as Bro. Norm often says thank you and Bonnie for getting it. We are excited about the projects we have brought back to share with our Church so they may be a part of spreading the Word and the love of Jesus. So all may know! I am BLESSED once again, with the praise reports, blessings and love that y'all write! :-) Love y'all! Thanks for sharing what God is doing. I am so excited and cannot wait to serve the people there in Ghana very soon.